The Lemelson Foundation, the world’s leading funder of invention in service of social and economic change, and the Blum Center for Developing Economies are embarking on a yearlong collaboration to enable students participating in the University of California Big Ideas Contest to increase their expertise in developing environmentally responsible inventions and innovations. The initiative exposes students to sustainable practices with the goal of increasing awareness around environmental impact throughout the invention and business model development process–from the materials used to the end of lifecycle implications. The partnership between The Lemelson Foundation and the Blum Center will enhance the importance of environmental responsibility in the Big Ideas Contest, with special emphasis on the Hardware for Good category. Additionally, there will be an increased focus on engaging students from low-income and underserved backgrounds to participate in the contest. Since 2006, the Blum Center has hosted the Big Ideas student innovation prize, to provide mentorship, training, and resources for budding social entrepreneurs across the University of California system. Hardware for Good encompasses everything from wearable and assistive technologies and devices to improve agricultural productivity to smart home systems that improve energy efficiency and safety. The 2017-2018 winner in the Hardware for Good category was Innovis Medical, a blood clotting prevention device for civilian and military trauma care that is being tested on cardiac patients at UC Davis Medical with the aim of FDA approval by 2021. With support from The Lemelson Foundation, Big Ideas 2018-2019 activities will include educational programs coupled with outreach to keep environmental responsibility top-of-mind as student inventors and innovators design new devices and ventures. Judging criteria will also be modified to reflect greater emphasis on environmental impact. 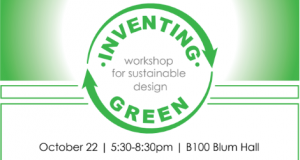 Among the student education programs will be the “Inventing Green” workshop on October 22 to raise awareness and understanding of environmental responsibility in innovation and entrepreneurship among the University of California’s 240,000 undergraduate and graduate students and participating students from Makerere University in Uganda and Hebrew University in Jerusalem. The Lemelson Foundation funding will also support Blum Center practitioners-in-residence who will provide environmentally responsible design expertise to Big Ideas student teams and their projects.